We only have 11 points. Should we open the bidding? It seems that the points are evenly distributed between the sides. There are a total of 40 points available, and we have 11. That means the other three players hold 29 points between them. No-one has 12 or more points otherwise they would have opened the bidding. If we bid, the game might be played in our contract, but there is also the possibly that the opponents could overcall and get to their part score. If that happens, it would be better for us to pass too. How do we decide if we should open or pass. The key question is ‘Who has the Spades?’. Add our High Card Points (HCP) to the number of spades we hold. If the answer is 15 or more, open the bidding otherwise pass. This hand has 11 HCPs and only 2 spades. This gives us a total of 13, so we should pass. If we opened this hand at the one level there is the possibility that the opponents could overcall at the 1 level. Hand 2 is essentially the same hand but the suits are swapped around. Hand 2 has 11 HCPs and 5 spades. This gives us a total of 16 so we are happy to open the bidding with 1 Spade. For the opponents to overcall they would need to bid at the 2 level. I would use Rule of 20 per Audrey Grant — add points to length of two longest suits. Since there are 5 diamonds and 4 hearts, I’d open. 9 an 11 equal 20. @ Maggy. The Rule of 20 would allow a previous player to open. The Rule of 15 is specifically for use by the fourth player when it has become clear that the points are evenly distributed between players. The Rule of 20 allows an opening bid of 1 of any suit. 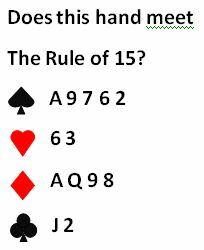 The Rule of 15 helps the last player decide if an opening bid of 1 spade is appropriate, to prevent over calling at the one level by the opposing partnership.